Little Common Football Club’s cup game tonight (Tuesday) was abandoned late on due to a floodlight failure. The Commoners were 3-1 down at home to Ringmer when the Macron Store Southern Combination Football League Division One Challenge Cup first round tie was halted after 87 minutes. 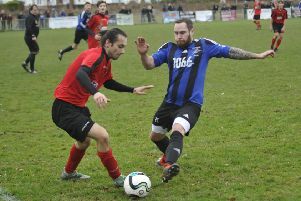 Jamie Crone tussles with a Ringmer defender. The league will now have to decide whether to allow the result to stand or to replay the game. The winners, incidentally, will be away to Storrington in round two. If they do get a second chance, Common will be extremely fortunate having produced a well below par display on a wet and windy night at The Oval. Common had what was initially a strong breeze behind them during the first half, but fell behind after just five minutes against a side which they beat 5-0 in the league last month. Ringmer wide player Stephen Jackson got the better of Dom Bristow before scoring with a terrific shot from the right-hand side of the area into the far corner, with the aid of a slight deflection. Sam Ellis on the ball. Lewis Hole saw a well-struck shot from the left-hand side of the box beaten away by Ringmer goalkeeper Dan Hutchins a couple of minutes later. Common dominated possession as the first half progressed, but struggled to carve out goalscoring opportunities. Russell Eldridge lashed a shot just wide from 30 yards and Sam Ellis was denied as he tried to nod the ball past Hutchins. Tom Shelley headed wide of the far post from a Ringmer corner before Common levelled towards the end of the first half. Eldridge played a lovely pass to put Crone through on goal. Crone went down as he tried to round Hutchins and the referee pointed to the spot, although Hutchins seemed adamant he hadn’t fouled the Common forward. Eldridge scored the penalty despite Hutchins getting a hand to it. Ringmer were further incensed moments later when a penalty appeal of their own was turned down as Common goalkeeper Matt Cruttwell slid in. Cruttwell then saved from Jackson right on the half time whistle. With the rain now setting in and the wind strengthening, conditions were horrible throughout the second half. Ringmer went back in front five minutes after the restart. After receiving a good pass, Jackson beat Cruttwell with an angled shot from the right-hand side of the area which the goalkeeper got a hand to but couldn’t prevent from nestling in the far corner. Jack Rowe-Hunt’s drive for Ringmer deflected into the side-netting, while at the other end, Lewis Hole’s shot on the turn was well saved by Hutchins and Ellis blasted the rebound wide. Ringmer extended their advantage via a superb goal from Mark Pulling in the 59th minute. After dispossessing Jamie Fielding by the touchline on the away right, Pulling spotted Cruttwell off his line and executed a sublime chip into the net from probably 40-plus yards. Missing the poise of Wes Tate in midfield, Common didn’t look like getting back into it thereafter and Ringmer could even have gone further ahead. Khalid Bilal shot wide of the far post having been put through on goal by a quick throw-in. Jackson whipped a free kick from the Ringmer left just over the top and Pulling almost repeated his earlier trick, this time from not quite so far out, only for the ball to come back off the crossbar. A fierce strike by substitute Rosh Wells from just outside the area at the other end was well parried by Hutchins before being cleared to safety. With the game seemingly slipping away from Common, all three floodlight pylons on the southern side of the pitch suddenly went out, forcing the referee to halt play. Most of the players sheltered in the dugouts as efforts were made to get the lights fully functioning again. Ten or so minutes later, five of the six pylons were working, but the players returned to the dressing rooms as the referee abandoned the game. Common: Cruttwell, Walker (Wells), Bristow (Maynard), Ward, Fielding (Parsons), McEniry, Smith, Eldridge, Hole, Crone, Ellis. Sub not used: Ryan.